Dance It! is a week-long annual dance workshop which takes place in Bulgaria during the academic spring break (March 31 – April 6, 2014, Festivalna Hall, Sofia, Bulgaria). 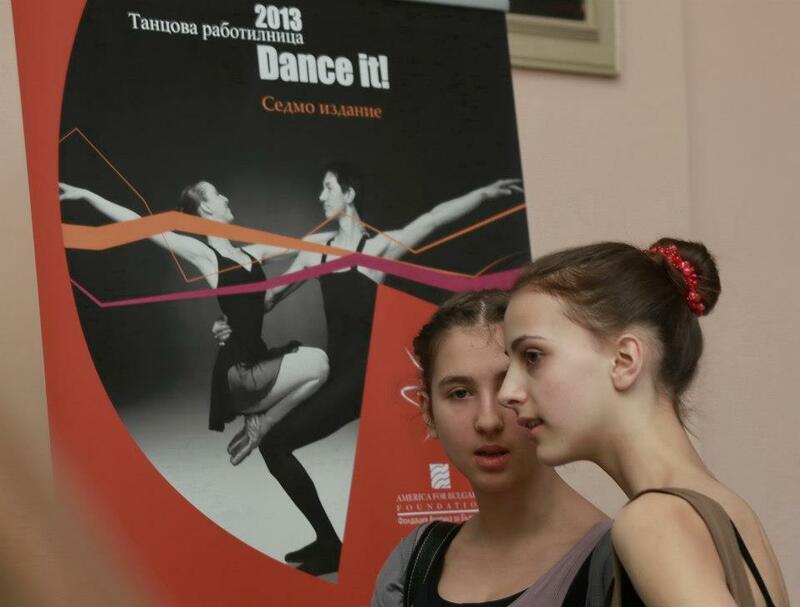 It is an international collaboration which targets young dancers from Bulgaria (mainly) and from all over the world. 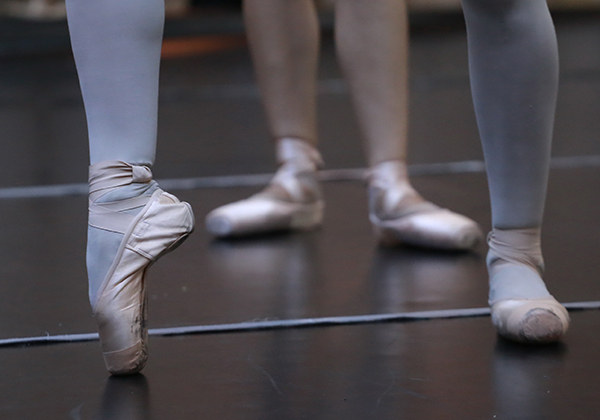 In the course of the week, young dancers (both professionals and advanced amateurs in training) take classes in five different styles: Classical Ballet (Balanchine style), Modern Dance, Jazz, Hip-Hop, Character Dance. The classes are taught by renowned teachers and choreographers from both continents who bring unique expertise to dancers who do not have the chance to experience it in their routine dance curricula. 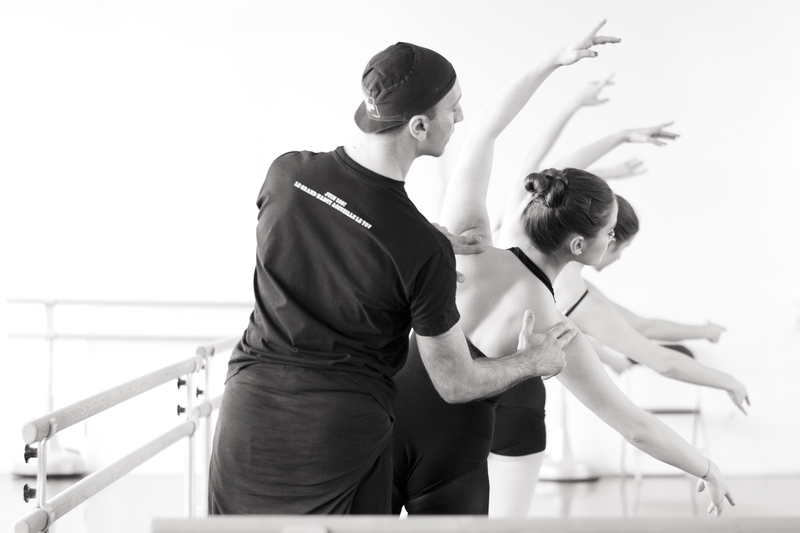 Each student also participates in a choreography set up during the course of the workshop. 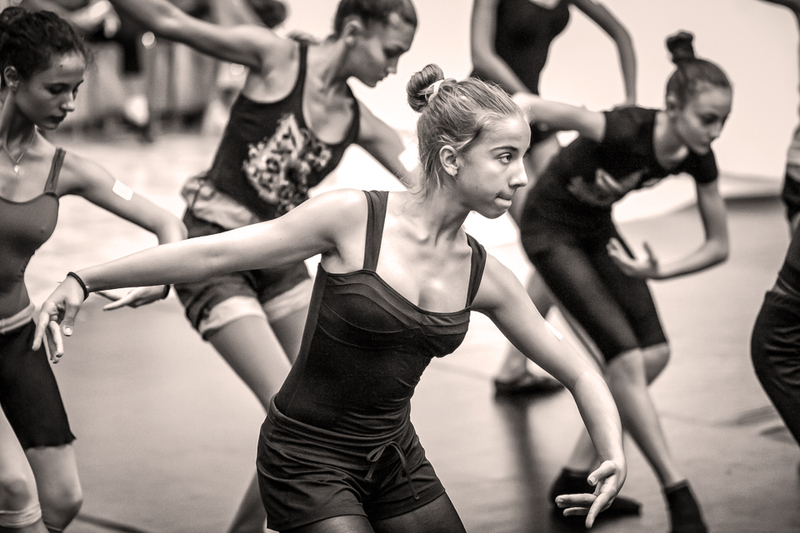 The goal of the project is to give young dancers the opportunity to acquire knowledge of several fundamentally different dance forms and techniques, while also allowing them to take part in the creative process and experience international exchange and intercultural communication. The spring program closes with a big final show – a combination of the new pieces of the choreographers involving all workshop participants and repertoire shown by specially invited renowned guest dance artists. In the course of the workshop week, different dance master classes as well as public discussions on relevant topics also enrich the program. Each year, five or six of the best workshop participants receive scholarships for summer dance intensive programs in renowned U.S. schools and companies. Since 2008 more than 700 dancers from Bulgaria, Serbia, Macedonia, Montenegro, Portugal and USA participated in all 8 editions of Dance It! More than 25 young talents received scholarships for schools such as Pacific Northwest Ballet School, School of Ballet Chicago, Debbie Reynolds Dance Studios, Syracuse University, Deeply Rooted Productions etc. 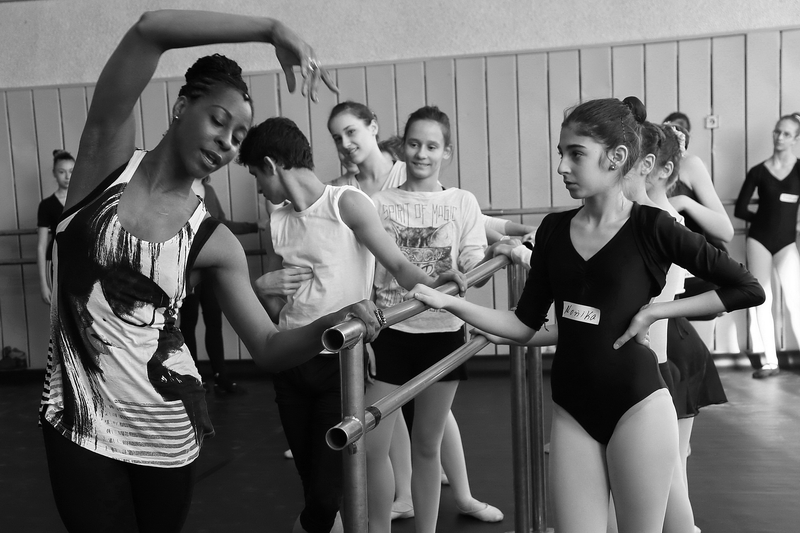 Many of our scholarship students currently work in dance companies in Italy, Germany, the U.S. and in Bulgarian state dance institutions as well as private dance formations. Nicholas Ade is from Los Angeles, Ca. He trained at San Francisco Ballet School and the University of North Carolina School of the Arts. He danced with the Pacific Northwest Ballet (PNB) from 1996-2006 under Francia Russell, Kent Stowell and Peter Boal. While with PNB, Ade performed leading roles in George Balanchine’s The Four Temperaments and A Midsummer Night’s Dream; Ronald Hynd’s The Merry Widow; and Kent Stowell’s The Tragedy of Romeo and Juliet. He has also been featured in Balanchine’s La Valse, Prodigal Son, Symphony in C, Symphony in Three Movements, and Who Cares? ; and Peter Martins’ Fearful Symmetries. He originated featured roles in Val Caniparoli’s Torque and Nicolo Fonte’s Almost Tango and Within/Without. Prior to joining Central Pennsylvania Youth Ballet as school principal, Ade served as principal of the Pacific Northwest Ballet School’s Francia Russell Center, PNB’s Eastside School, under Artistic Director Peter Boal from 2006 through 2012. Ade also serves as permanent guest faculty at Ballet Academy East in New York City under Darla Hoover and Julia Dubno. He has taught throughout Europe and North America, including the Iliev Foundation in Bulgaria. Ade has also taught at Tri-Cities Academy of Ballet, Utah Regional Ballet, and the University of North Carolina School of the Arts. He also has been on faculty at several national and regional festivals for Regional Dance America (RDA). Ade’s relationship with RDA has also extended into adjudicating in 2010; as well as serving as host to the Craft of Choreography Conference (CCC) and Summer Intensive from 2007-2009 and has been on the faculty of the CCC from 2004 through 2009. 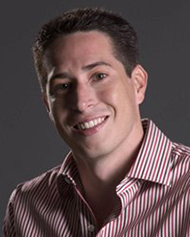 He has served as host of PNB’s Eyes on Dance and Discover Dance outreach performances and has been Project Coordinator for PNB’s NEXT STEP (formerly Choreographers’ Showcase) since 2005. Theresa Ruth Howard is a New York based teacher, writer and coach who has both performed and taught internationally. A former member of The Dance Theatre of Harlem and a founding member of Armitage Gone! 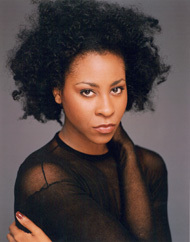 Dance she has also appeared as a guest artists with Complexions Contemporary Ballet and Donald Byrd/The Group. She has taught at The Alvin Ailey School, The Joffrey Ballet School, Dance Theatre of Harlem, and The American Dance Festival. She has taught at various institutions including Marymount Manhattan College, University of the Arts, and Hollins University where she was an Artist in Residence. 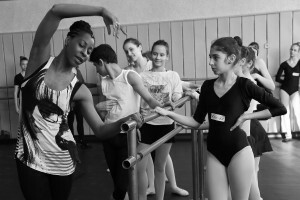 Ms. Howard has also been a contributing writer to “Dance Magazine”, “Pointe Magazine” and “Dance Teacher”. She taught extensively through out Italy working with The International Dance Association and Music Arts & Show in Milano (MAS), and has also contributed to the Italy’s Expression Dance Magazine. She, along with Dance Magazine’s Editor in Chief Wendy Perron, began an online dance Review Series entitled See and Say. Combining her philosophies of life and teaching, with the skills she garnered through outreach programs with diverse communities, she developed the personal development workshop “Principles of Engagement: Connecting Youth to the Infinite Possibilities Within” which gives teens a set of workable tools to increase their levels of success at tasks, and goals not only in dance, and all aspect of their lives. Most recently Ms. Howard created a Body Image Workshop based on the articles she has written for Dance Magazine, this prompted her to broaden her audience hence she has started a Body Image Blog (http://mybodymyimage.com) which address issues concerning the body for young girls, women, dancers and non-dancers alike. 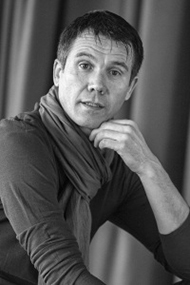 Christian von Howard is the Artistic Director of the VON HOWARD PROJECT, a Mid-Atlantic contemporary dance company. As an international artist, he has worked with many dance artists such as Doug Varone, Fernando Bujones, Douglas Becker, Germaul Barnes, Daniel Gwirtzmanand various others. 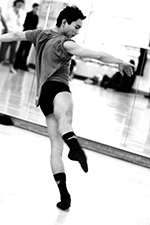 Christian is a NJ State Council of the Arts Choreographic Fellow (2006). Christian is a 2013/2014 recipient of the Distinguished Achievement in Teaching Award from Virginia Commonwealth University’s School of the Arts where he is an Associate Professor of Dance & Choreography. 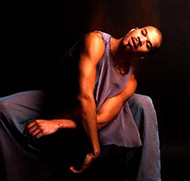 He concurrently teaches at VCU and the Alvin Ailey School in NYC where he has been on faculty since 1998. He holds a BFA from the School of Classical and Contemporary Dance at Texas Christian University and a MFA from Tisch School of the Arts, New York University. Marcus Galante has worked extensively as a choreographer and teacher throughout the world. Most recently, he was invited for a teaching engagement in Buenos Aires, Argentina where he taught Ballet & Broadway theatre dance workshops. In January 2014 he will create a new classical ballet for the New American Youth Ballet set to the Bronze Horseman by Reinhold Gli?re and will also teach advanced Ballet and Variations. Trained at the American Ballet Theatre School and the School of American Ballet, he was also a trainee at the Harkness Ballet in NYC. Some of his teachers include Patricia Wilde, Richard Rapp, Stanley Williams and George Balanchine. He went on to dance with many companies such as the Chicago Lyric Ballet under Maria Tallchief, Cleveland Ballet, Cincinnati Ballet, Eglevsky Ballet and was a soloist with the National Ballet of South Africa C.A.P.A.B. performing the classical repertoire. On Broadway, he sang, danced and acted in A Chorus Line, Pippin, Carousel and other shows. He has also worked in Opera, film and in television with Shirley MacLain. Mr. Galante has choreographed many successful ballet and theatre works and has done television and film choreography. In 1995 he nominated for a Dance in Film Award for the short film Private Performance with director Morgan Spurlock. He has been awarded fellowships from the National Endowment for the Arts (Choreography) and grants for choreography from Harkness Foundation for Dance. 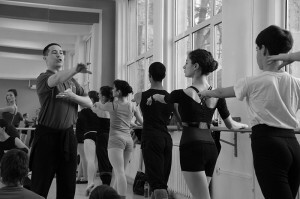 As a teacher, Mr. Galante has been on the faculty of some of the most prestigious schools in the country – New York City Ballet, Alvin Ailey American Dance Center, Pennsylvania Ballet and Company, Pacific Northwest Ballet, Lines Contemporary Ballet Company, Eglevsky Ballet, Ballet Chicago, Steps on Broadway, Broadway Dance Center, Ballet Arts (NYC); the Midwestern Regional Ballet and The Chicago National Association of Dance Masters; and many others. His international experience includes invitations to St. Petersburg, Russia, Finland, Japan, Bulgaria, Montenegro, Germany, Argentina, Brazil etc. Andrea is a professional dancer and teacher based in Los Angeles, California. She is signed with Go to Talent Agency. This past summer, Andrea went on tour with Macy’s Glamorama “Fashion in a New Light” show where she shared the bill with Cirque de Soleil, the Backstreet Boys and Sheryl Crow. Her recent credits include the finale of the television show the Voice, Comic Con and Mandy Jiroux’s “Speakers Boom” music video. Last summer, Andrea was chosen as one of 8 girls in the US to be in “The Mobsters Way”, the Monsters of Hip Hop show in LA. Now she assists on the Monsters of Hip Hop convention tour. Andrea was recently in a short film called “Today is the Day”, directed and co-choreographed by Tamara Levinson and Daniel “Cloud”Campos. Last year Andrea danced with Rihanna on the X-Factor, where she performed the world premier of “We Found Love” choreographed by Tina Landon and Tanysha Scott. In 2011, Andrea lived in China for 6 months teaching hip-hop and performing around the country. Upon return to the States, she co-directed a full length hip hop dance show in Seattle. Some of Andrea’s credits include: August Jackson Industrial in Las Vegas, Poser’s LA, Carnival LA, Cruz Control’s show at the Moore Theater, Seattle Seahawks halftime show, Vietnamese music awards, and the Young Tanzsommer Austriatour with Westlake Dance Center Performing Group. Andrea is credited with award winning choreography which has been selected to perform at Disneylandin CA, and the RDA Dance America Festival inUtah. She has received scholarships to Steps on Broadway in NYC, Millennium Dance Complex in LA, Debbie Reynolds in LA and various convention scholarships from Monsters of Hip Hop, Company Dance, Hollywood Vibe, LA Elite, Encore, and West Coast Dance Explosion. Petur Iliev is a Bulgarian-born dancer and choreographer whose career is deeply steeped in the rich folk dance traditions of his family. He started dancing at the age of five at the dance ensemble of his father. Later he graduated from the Bulgarian National School of Dance Art and from the Bulgarian National Institute of Choreography in Sofia, Bulgaria. He began his professional career as a Principal Dancer of Kutev National Dance and Music Ensemble where he worked for five years, before continuing his training at the National Dance Institute in New York where he studied under the supervision of one of the gurus of American dance – Jacques d’Amboise. 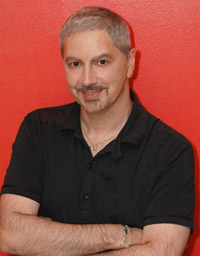 Subsequently, Iliev became the Artistic Co-Director of Believe in Me — a dance ensemble in Austin, TX, where for four years he trained more than a thousand young dancers. Moving to California, Iliev continued working in the American educational system teaching dance to hundreds of children in a performing arts magnet school. A year later he was appointed the Artistic Director of Westwind International Dance Company — one of the first companies in the US whose mission is to present to the American audience the richness and diversity of ethnic dance. All along Iliev has been teaching master classes in Character dance and Bulgarian folk dances at many colleges and universities in different parts of the US, and has been creating new choreographies for professional and non-professional dance companies in the US and Canada. In 2003 he joined the faculty of the renowned school of Pacific Northwest Ballet and two years later he was attracted to the school of Ballet Chicago. Along with that, for several years Iliev shared his expertise with numerous students in the public school system in Chicago through a 21st Century grant. With this invaluable experience in hand he resumed his activity in Bulgaria in 2008 through the various programs of his foundation established in the same year. The Iliev Dance Art Foundation has since been running several highly successful educational programs: the Spring and Summer Intensives Dance It, as well as children’s dance programs targeting youth from public schools. Most recently Iliev appeared as a judge on the national reality dance show Magadans – The Challenge, as well as created and staged a full-length children’s show Click, performed in October 2013 as part of Sofia Dance Week. In addition, he has also actively been teaching and choreographing at The Anglo-American School of Sofia, both instructing children from various classes, as well as choreographing for the final musicals performed by the graduating classes. In Bulgaria Petur Iliev’s artistic creativity has been gradually coming to its full potential in the creation of several highly innovative choreographies that reach to the core of the Bulgarian ethnic dance and release its structure – unleashing its potential as a means of expression by enriching it with the vocabulary of ballet and modern technique. More about the Founder and Artistic Director of Iliev Dance Art Foundation in the section About us/Founder. The master classes are free for all Dance It! participants. They will be held on Saturday (5th April). The artistic path of David Nicolas Russo started at the age of 9 years with dance classes in private schools, followed by one year with the Finnish teacher Pertti Virtanen in Turin and Genua (Italy). He attended summer classes with the Royal Ballet School in London and with the Rosella Hightower School in Cannes (France). In 1996 he joined the John Cranko Ballet Academy in Stuttgart (Germany) and graduated two years later under the Vaganova Teacher Pjotr A. Pestov. While staying at the Cranko Academy he had several professional stage experiences in ballets choreographed by J. Cranko, W. Forshyte and R. Zanella. From 1998 till 2000 he was a soloist of the State Theater of Saarbruecken (Germany). In the next 5 years he joined the company Ballet Theater Munich (Germany) directed by the British choreographer Philip Taylor. In Munich he worked in choreographies by Jiri Kilian, Jennifer Hanna, Rui Horta, Dylan Newcomb, Olga Cobos & Peter Mika, Annett Gohre and Cayetano Soto etc. In July 2005 he started his freelancing career as dancer and choreographer on international level. 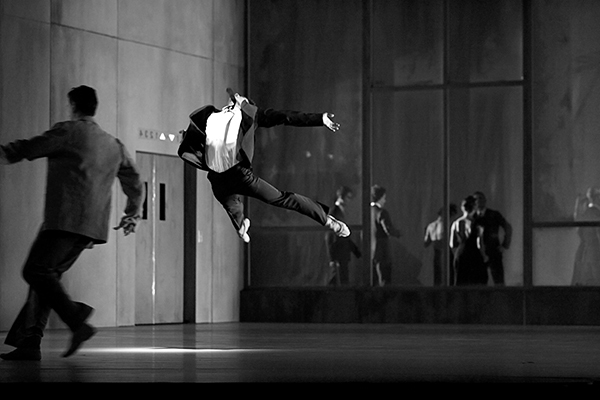 His solo piece “Marvin”, for example, has been performed in Switzerland, Holland, Begium, Germany, Denmark and the USA. 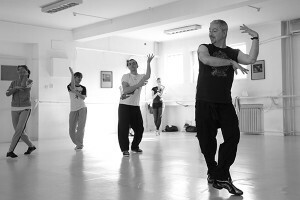 He also was a guest Ballet and Modern Dance teacher in several European dance schools. Since 2006 he also works with the Ballet Philippines in Manila, meanwhile contributing as a guest teacher in Modern and Ballet at the Philippine High School for the Arts, and also teaching in a local project for underprivileged children. From September 2007 until August 2010 he was engaged as soloist in Tanz Theater Munchen. In June 2010 he graduated in Ballet Pedagogy from the University of Music and Performing art Munich, and in September he accepted a teaching position at the Ballet Academy in Munich as a Ballet and Contemporary Dance Teacher. 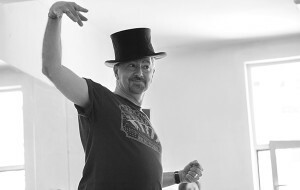 He continues also his career as choreographer with pieces such as “Ein-fluss” (2. International Choreographical Competion “Contact Energy”, Erfurt; Theater in Ulm), “@time” and “Tanzbescherung” (Theater i-camp, Munich). Sergey Sergeev – Arendar is a freelance choreographer, pedagogue and soloist dancer, born in Sofia, Bulgaria and currently based in Nurnberg, Germany. His passion for ballet was inspired at an early age by his mother and especially by her uncle Jivko Lyubenov who was coryphaeus – soloist dancer at the Bulgarian State Opera and Ballet in Sofia. He received his ballet training, and later his ballet pedagogy and choreography degree, at the Academic Choreographic School of Dance “Agrippina Vaganova” in Saint Petersburg, Russia. Later his active career took him to Turkey, where he was guest dancer in the ballet companies of Antalya and Izmir State Opera and Ballet and danced as soloist in “Hurrem Sultan”. Parallel to his dancing career, he taught at the State Conservatory in Antalya, as well as at the Turkish Rhythmic Gymnastics Federation, where he trained some of the Turkish gymnastics champions. This was followed by contracts with the companies for performances and projects in Ljubljana, Split, Belgrade, Klagenfurt, Krakow, Kiev, Nurnberg, Leipzig, Regensburg, Bonn. Sergey has performed classical repertoire as a soloist dancer (including “The Sleeping Beauty”, “Swan Lake”, “Shopeniada”, “Scheherazade”, “The Nutcracker”), as well as contemporary and musical pieces by Kristina de Chatel, Pina Bausch, Uwe Scholtz, Rubatto, Robert Nord, Christopher Jenkis, Paul Haze, etc. In the period 2004 – 2012 Sergey worked on a series of miniatures and dance routines for national and international ballet competitions, which resulted in two gold, three silver and six bronze medals. His choreographies are shown on ballet and theatrical galas, forums, television productions in Sofia, Antalya, Kiev, Bonn, Munich, Prague, Seoul, Washington, Helsinki, Istanbul and Moscow. In 2009, together with Silvia Tomova, for only 28 days Sergey staged his 70-minute version of “Carmen” in Pristina, Kosovo. 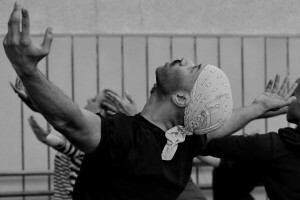 He named the performance “Chronics from Andalusia – Carmen”. It was a very successful project and Sergey often presents miniatures from it at festivals and competitions in Europe. 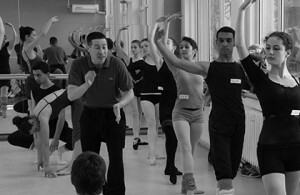 Sergey teaches at a number of private schools and academies, for example the Dutch Dance Academy Haarlem (2002), Antalya State Conservatory (2004 – 2006), Ballettakademie Furth-Nurnberg (2010), Ballettzentrum Vadim Bondar, Bonn (2012), Ballettаkademie Boniventi-Dazzi, Regesnburg (2013), etc. He teaches ballet, jazz and contemporary dance techniques at dance centers in Germany, Turkey, Bulgaria, Russia and Ukraine. Between 2008 and 2013 Sergey successfully developed his very own training method, called “Balloton” (from the Latin “balo” meaning “dance” and “ton” meaning “tonus”). In 2013 the method received a patent and was licensed in Germany, after presentations on international seminars and workshops, for example at the Karate Shotokan Federation in Nurnberg, Lauf, the Weber-Schule Physiotherapy and Sport Academy in Dusseldorf, UKD Universitatsklinikum, Dusseldorf and at other dance schools and ballet companies in Germany. In 2012 Sergey Arendar was one of the four members of the jury for the International Ballet Competition “Applaus” in Nurnberg, where he, together with some of the stars of Mariinsky, Mikhailovsky and Krasnoyarsk Theater, selected the most talented young dancers among 120 participants from all over Europe. Dance It! 2014 Spring Intensive Program ends, as usual, with a big final show, which will be performed on the stage of “Salza & Smyah” Theater on 6th April (Sunday) at 17:00 h.
Sneak Peek shows work-in-progress performance of the pieces of repertory developed by the six “Dance It!” choreographers during the one week they have to work with the young dancers participating in the program. 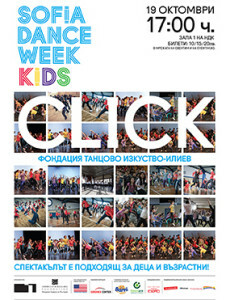 This year’s show includes also part of the repertory Petur Iliev and his assistant choreographers develop with around 80 students from four public schools in Sofia and Sofia Region for the “Dancing Kids” project, kindly supported by the America for Bulgaria Foundation and the US Embassy in Sofia. At the end of Sneak Peek, Iliev Dance Art Foundation team announces the chosen scholarship recipients for summer intensive courses in the USA for 2014. 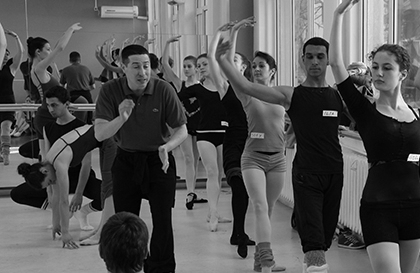 The scholarship program of Iliev Dance Art Foundation allows young Eastern European dancers to participate in summer intensive courses at renowned dance institutions in the States. This is one of the reasons Dance It! is held in the spring – so that the scholarship recipients can prepare to leave for the summer courses. Tickets can be obtained at “Salza & Smyah” Theater and at TICKETSTREAM. Price: 10 BGN. For the first time we offer also VIP tickets: the VIP ticket costs 30 BGN and includes the opportunity to meet our choreographers for a glass of wine before the show, allowing you to gain a new perspective on the dance art and its artistic process. 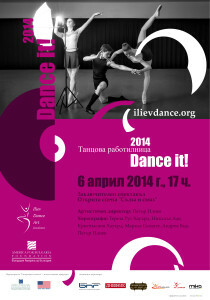 For reservations of VIP tickets, please call 0885 22 60 12 or write to info@ilievdance.org. Reason for Payment: “Dance It!” Participation Fee of … (full name of the participant). 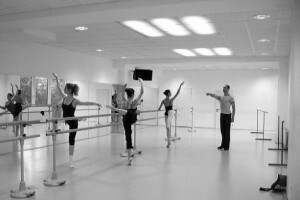 Participants should be aware that one dance style comprises of classes in dance technique and classes in choreography. If you want to take only technique classes or only repertoire classes, you still need to pay the whole fee. Please keep in mind that the program is very intensive. It is possible that you find it difficult to keep up with the repertoire work in more than 2 or 3 styles (according to your level and motivation). 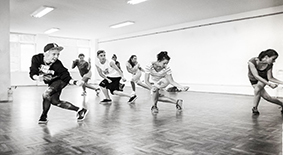 Nevertheless, you can sign up for and visit all dance styles, but especially for the repertoire classes in the afternoon we advise you to focus on no more than 2 or 3 styles.